Pardon me, but this is serious. OK. Here is an on the spot post. I did not plan on writing this, but then something happened. A mother sent a tape into Dr. Phil of her “disciplining” her child with mouthfuls of hot sauce and cold showers as punishment for such things as lying and being defiant. 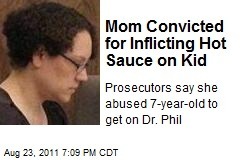 Since airing, the woman was brought up on charges for child abuse. Although that stirred me, it is the fact there are people out there being interviewed by major news media sources who are sticking up for this lady that makes me physically sick! Are you kidding me? There are people saying this is OK? This is part of parenting? Come to find out the child actually is diagnosed with Reactive Attachment Disorder. This is a diagnosis given to children who have experienced trauma or neglect early in their lives and struggle with relationships (usually with foster parents or adoptive parents) and have challenging behavior problems. So, to treat this, she inflicts more trauma? Oh, and when was the last time you attached to someone who abused you? The actions of this woman were reprehensible. The actions of those who defend her actions as “discipline” are despicable. Please understand that if normal forms of punishment are not working with your child, it does not mean you should increase the intensity of the punishment. This results in incredibly harmful side effects to the children, some being more challenging behaviors. I’m not against some forms of punishment, when used appropriately. Seek good, qualified help if you are having trouble. Seek people who know, understand and are trained specifically in behavior. This is not work to be done on a couch, “talking through feelings.” This is hard. It can’t be “talked out.” Also, be careful of who you read…this lady is a reporter and she put the listener in a position to expect her to be an expert on raising children. Be smarter. Be compassionate. Seek help if you need it.